2 years ago, this ride would have never happened. I was 100 pounds overweight, out of shape and most definitely not athletic. The Founder of CAF, Jeffrey Essakow, a friend and business colleague, cared enough about me to say something. From that moment, I chose to do something about my health. I had no idea that moment would lead me to becoming more active and now I am walking, swimming, jogging and biking and now training for such an amazing ride, all while using my story to raise money for such a worthy cause. My first step was that conversation with Jeffrey Essakow 2 years ago. 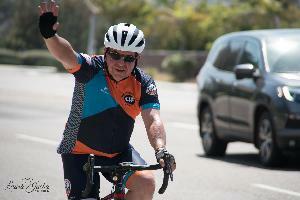 It will culminate in my "Rocky" moment at the end of this ride and hitting my goal or raising $15,000. Jill Krenkler, J&J Krenkler Insurance Services Inc.